Similar to the last post I have also been asked to listen to a serial port and import the data into NAV. I even used the same VB.NET service. On the NAV side I added two functions to my web service. Where RMSerial is a table with the following code. 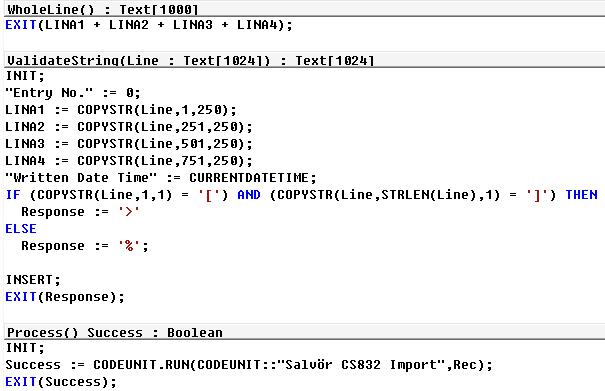 Here is the VB.NET code for the service. Dim LineResponse As String = ""
I am currently working on a solution that requires a Dynamics NAV client to communicate with Dynamics NAV web service. This I have done before with the classic client and have used automation objects for the job. Now I wanted to do this with dotnet only objects in the Role Tailored Client. Took some time to put all things together but here it is. This version is running the request from the client. On of the bigger tasks when upgrading to the Role Tailored Client is the report transformation. In big database there are houndreds of reports. Some of them might just be idle reports that are never used. This blog from ArcherPoint that is based on a original post from Mark Brummel got me thinking. 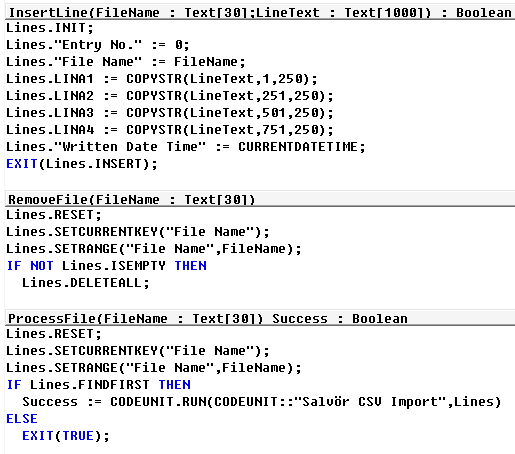 In 2009 Microsoft added to the client the possibility to execute a function with ID 120 in codeunit 1 that only works for the Classic Client. 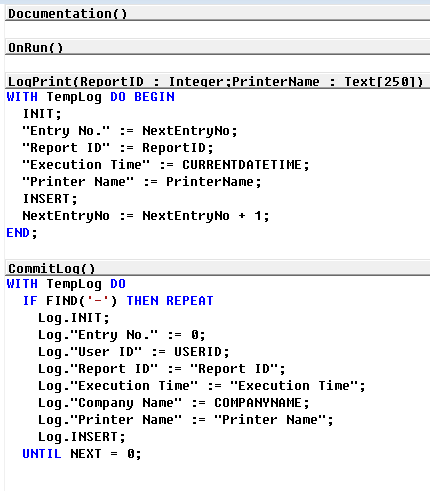 I mixed these together by adding the code to codeunit 1 in the same way as Mark Brummel but creating a report log table instead of a report print count table. Here the Entry No. field automatically increments the numbers in the database. I also changed the property DataPerCompany for the table to No. The single instance codeunit is also a simple one. The next step might just be to create a report for Excel Pivot table like I did with ledger tables. 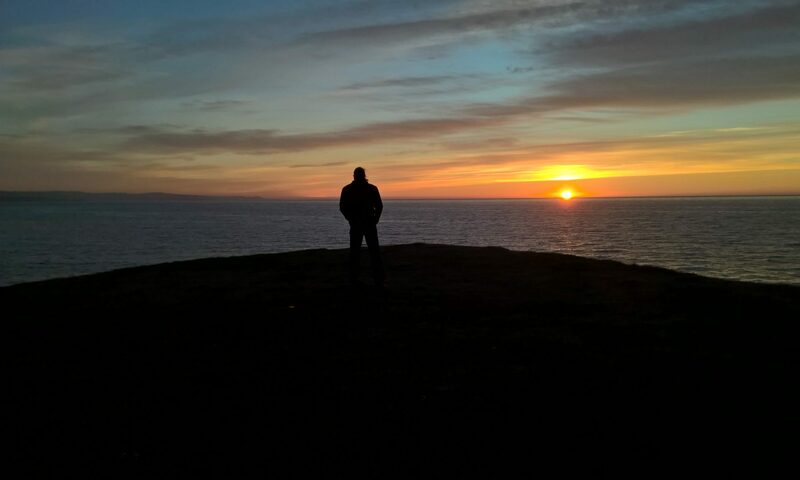 Over the past several months the NAV team has worked hard getting ready to release Microsoft Dynamics NAV 2013. We’ve run hundreds of thousands of performance-, stress-, unit- and regression-tests daily. We’ve monitored the comments you’ve made on our first-ever public Beta of NAV and incorporated the feedback as much as possible. And, we’ve worked with partners bringing several customers live on NAV 2013. All of this has been to ensure that the product is of the highest possible quality before we ship. We’re looking forward to getting the RTM version in your hands as soon as possible! Microsoft Dynamics NAV 2013 is probably the biggest launch of the product ever. It concludes the transition from the classic client/server 2-tier proprietary architecture developed in the 1990’s to a state-of-the-art, 4-tier Microsoft architecture capable of rendering multiple clients and facilitating multiple modes of integration. It also means that Microsoft Dynamics NAV now is a full-blown member of the Microsoft server family and adheres to all Microsoft standards in terms of security, reliability and scalability. Finally, it signals the beginning of a new era of “NAV in the cloud,” opening up an array of new opportunities using NAV and integrating it with Microsoft and non-Microsoft products. With Microsoft Dynamics NAV 2013 coming out this fall, the NAV TechDays conference is a great opportunity for everybody in the NAV developer community to learn more about and get ready for the release. All the sessions at NAV TechDays are technical and long enough to allow the speakers to go into enough detail for the developers in the audience to understand what the features in the product are about and how to use them. Since NAV TechDays is a conference for developers by developers with deep technical content, we are sending some of our best developers who designed and wrote the code to attend and speak at the conference. If you have questions about your favorite feature, you will have an opportunity to give your feedback on Microsoft Dynamics NAV 2013 and provide input on what you would like to see in future releases. I hope to see you all at NAV TechDays in Antwerp, Belgium on September 27th. XE.COM claims to be the world’s favorite currency site. 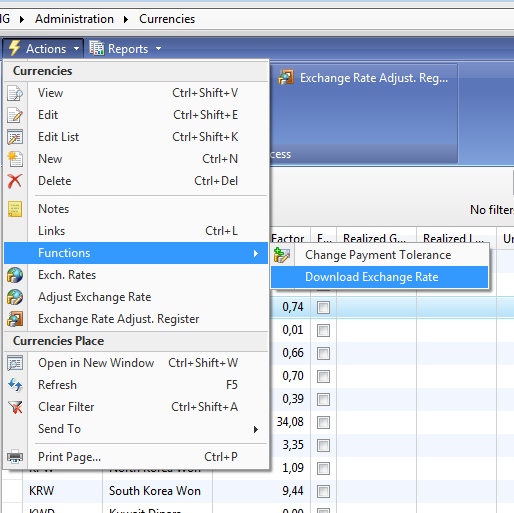 They have XML data feed options that can be used to download the latest currency exchange rates into Dynamics NAV. I wrote a batch to import the current currency exchange rate from their data feed. It is attached. If you are like me, located in a non-English speaking country and would like users to be able to use other tools then the Dynamics NAV clients to access the company data you will find that all the meta data in the database is in English. This means that you will have to translate the fields and sometimes the data to your language. Lets take the G/L Entry table as an example. 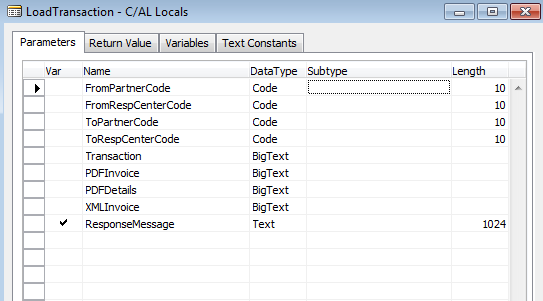 In the MS SQL the field names are in English and the data not readable for the normal user. and for example the [Document Type] will show as numbers. Here is an example of the output of my tool to create a localized view for this table. Executing this will give me a view in my database that I can use to fetch localized data from the G/L Entry table with all the above problems solved. By using the additional date table as dimension in OLAP or as join in a SQL query I can easily find all aspects of the “Posting Date” in the G/L Entry table and group entries accordingly.